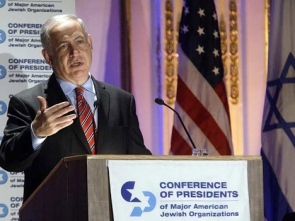 Benjamin Netanyahu speaks to members of the Conference of Presidents of Major American Jewish Organizations in New York, on July 7, 2010. A group of leading American conservatives has set up a new group to attack President Obama over his “anti-Israel” stance, U.S. website Politico reports. Washington observers may feel there is no obvious shortage of pro-Israel lobbyists in the city – but a group of leading American conservatives thinks otherwise and has set up a new campaign group to attack President Obama over his “anti-Israel” stance, U.S. website Politico reports. The Emergency Committee for Israel presents a potent combination of Republican Party neoconservatives and Evangelical Christians. The new group’s board includes Weekly Standard Editor William Kristol and Gary Bauer, a former Republican presidential candidate who leads the group American Values, as well as Rachel Abrams, a conservative writer and activist. The ad slammed Sestak for signing a letter criticizing Israel’s blockade of Gaza while declining to add his name to a defense of Israel circulated by powerful pro-Israel lobby AIPAC (the American Israel Public Affairs Committee). “Does Congressman Joe Sestak understand Israel is America’s ally?” the ad’s narrator asked. This is just the opening shot in what the Emergency Committee for Israel intends to be a series of ads to sway congressional races across the U.S.
“We want to be hard-hitting; we want to get into the debate and shake things up and make some points in a firm way,” said Noah Pollak, the group’s executive director. Kristol said this group was inspired in part by another new group, the liberal J Street, which he said had shown the power of small organizations to influence the debate. Ma’an – A PLC member in Gaza and an Israeli MK reported Tuesday afternoon that warships had surrounded a Libyan aid ship 100 kilometers off the Gaza coast. A military spokesman said he could not confirm the reports, made to Ma’an from Jamal Al-Khudari in Gaza and MK Ahmad Tibi in Jerusalem. Tibi and Al-Khudari, who are both reportedly in touch with the ship’s organizers, said the crews were determined to continue to their destination, the Gaza City Port. Al-Khudari said he believed Israeli warnings were serious, noting the similarity of the Israeli actions to the 31 May attack on a ship from the Freedom Flotilla, when commandos belayed on board and shot nine passengers in order to commandeer the vessel. A recent military investigation into the incident found no fault with the actions. Shortly after noon, the Israeli military made radio contact the ship which left the Greek port of Athens on Saturday under a Moldovan flag. Radio Israel reported the contact involved a request to the captain of the ship to dock in the Egyptian port of Al-Arish, and to abandon plans to dock in Gaza City. 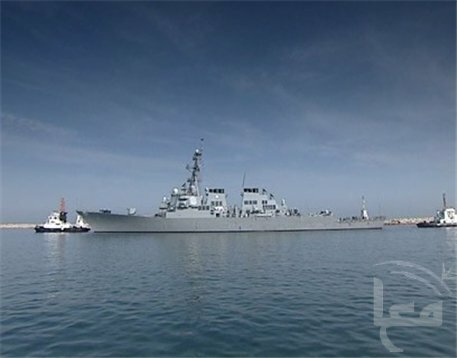 The Associated Press quoted Libyan organizers saying the crew had been contacted and ordered to change course, though military officials denied the report. The Gadhafi International Charity and Development Foundation said its boat refused to alter its destination and will steam on for Gaza, the AP said. At the time, and Isralei military spokeswoman said to the best of her knowledge the ship had not responded. Hours earlier, senior Hamas member Ahmed Yousef announced that in 24-hours, a Libyan ship would dock in the Gaza City Port, and finish the mission of the Mavi Marmara. Speaking for the committee to end the Gaza siege, Yousef called on Arab states to support the ship, organized by the son of Libyan President Mumar Gadhafi. Yousef’s encouragement came the day after hundreds rallied in Gaza City, encouraging the ship to stay its course, following rumors that it would divert to the Egyptian port city of Al-Arish. At the same time, Israeli media said the nation’s military was preparing to once again stop aid ships en route to Gaza using “forceful interdiction,” while a report from the Jewish Telegraph Agency said the Israeli foreign ministry warned the military not to intercept the ship in international waters. According to the Israeli daily newspaper Haaretz, the same recommendation was made in advance of the Freedom Flotilla, which was attacked 91 miles from the Gaza coast. While the interception of the Rachel Corrie ship in early June was peaceful, passengers aboard the Mavi Marmara, a cargo ship sailing under the Turkish flag as part of the Freedom Flotilla, attempted to fight off Israeli commandos boarding the vessel. The resistance cost nine Turks their lives, one of whom was a dual Turkish-American citizen. The Israeli military found its soldiers were not at fault in an internal investigation already being criticized for bias, while a second state investigation has yet to get underway as members of the investigation team and peace groups demand an expanded mandate for the inquiry, after Israel refused to participate in an international investigation of the attack, which occurred in international waters.